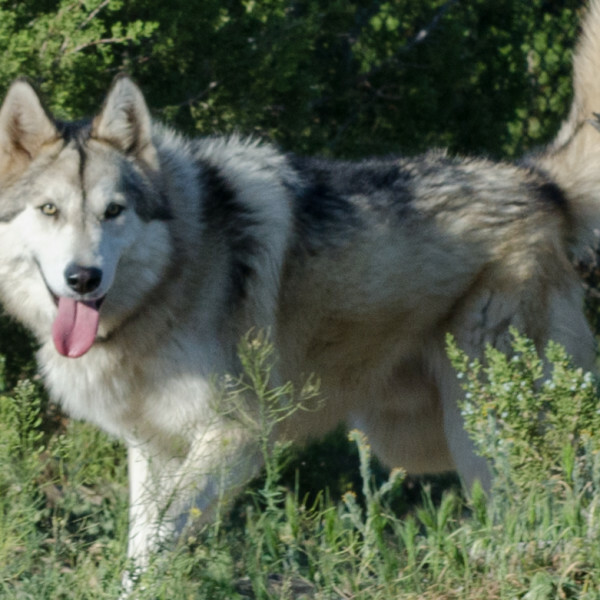 Ryder joined Wolf Connection at the age of just a year old. A young woman adopted him after seeing a post on Facebook that someone was going to take him to the shelter. Knowing that he would be euthanized, the young woman took him despite warnings that she would not be able to contain him. Ryder escaped many times and walked the neighborhood until the neighbors began complaining. After threats from neighbors and complaints from Animal Control, the woman asked Wolf Connection to take him in. Ryder is young and spunky. He has a very sweet way of gently jumping up and placing his paws on staff…He has a way of doing so without much impact and he gives sweet kisses. When he is not acting that way…he is generally pushing boundaries and inciting mayhem with his kennel mate.